Threats of underground water pollution imminent in Nigeria? The title of the article below which was published in the Daily Trust of August 26, 2015 and written by Alex Abutu based on what Mr. Michael Ale, AWDROP National President told Daily Trust, sounds alarmist as its scope is very limited compared to its content. Groundwater pollution in Nigeria cannot and should not be mainly ascribed to the activities of foreign borehole drilling companies. It is due to a number of causes – poor borehole design by incompetent drilling companies, point-source and non-point-source pollution, unregulated waste disposal practices, unscientific design and siting of sanitary landfills, improper decommissioning of non-productive or failed boreholes, unsupervised drilling activities of oil prospecting companies, etc. to mention A few. fairly detailed summary is contained in the table provided by Canter(1981) which lists 3 major sources of groundwater pollution – Waste disposal sources, Nondisposal sources and Depletion. Please click below for the table on major sources of Groundwater Pollution. • Too many boreholes and well interference. These are sweeping statements which are difficult to substantiate, for example, that using large equipment is unfavorable, detrimental or adverse to our environment in Nigeria. Furthermore, drilling many boreholes per day, if scientifically located and properly designed and supervised should not cause any problem with respect to well interference or pollution. Currently, the National Water Law has not been enacted. However, in Part X of the draft National Water Resources Act of 2011, reference is made to the Code of the Regulation of Domestic Boreholes which was developed by the National Water Resources Institute (NWRI) and the Ministry. This Code’s section 4 is on Legal Consideration. Section 4.1 is on Drilling Permit which states “No well shall be constructed unless the owner is in possession of a valid permit to do so … Permit shall be given by relevant Agencies designated by the Minister of Water Resources.” This is fine but has no legal backing until the Water Resources Act is enacted. Section 4.2.1.1.1 gives an exemption to the stipulation of the Code as stated above. As mentioned earlier, the National Water Resources Act is yet to be enacted, the Code is part of the Act, consequently the alarm raised by the article concerning foreign companies using unlicensed drillers cannot be resolved at this point in time. A lady driller supervising a borehole drilling recently. Nigeria is facing an imminent danger of underground water pollution if the activities of foreigners drilling companies are left unchecked, the Association of Water Well Drilling Rig Owners and Practitioners has alerted. “Another major issue is the fact that the underground water is gradually being polluted by the design of drilling embarked by the Asians as most of their designs allow infiltration of overburden water into the underground aquifer through the screening of the overburden casing without appropriate grouting. We are not talking of the cheap materials used during their installation. This is sad,” Ale added. 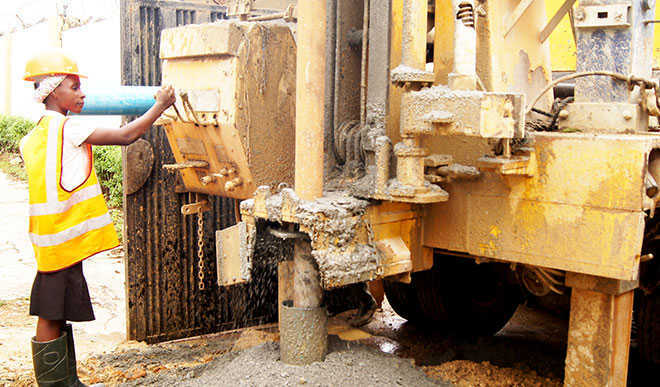 Investigation by Daily Trust in Abuja and environs showed that there is an upsurge in the number of foreigners in the borehole drilling business. In Masaka, a suburb near Abuja, numerous signposts advertising the foreign drilling companies abound with some engaging in promos to woo customers. “Some people have argued that the Asians made borehole affordable to most Nigerians but is it affordability or sustainability that we should be talking about? Yes their borehole can be affordable for 2-3 years but will pack up with time. It may be affordable but the client gets contaminated water because of the drill design,” he added.